and he should have, it was his turn next....he was brushed, bathed, dried, clipped, trimmed and brushed some more. He didn't like the bath bit but he enjoyed the rest of the pampering pooch session. He no longer looks bushy and is all ready for summer. I've swept, weeded, tidied and planted out in the garden. We ate some lunch in the restaurant. Organic veg soup, a roll and a organic strawberry yogurt - all of which were delicious. Mr Fuzz had fish & chips with tartar sauce, which he enjoyed and then was only too happy to carry on mooching around the store with me. I bought a double quilt cover with 4 pillow cases....for the bargain price of £1.99...isn't that just crazy?! £1.99! I love the print, it matches my bedroom colours too. I love new bedding and I love bedding with a white background, it is so clean and fresh looking. I am one happy Easter bunny. I also bought a Ribba frame for this poster that I've had a while and only just remembered about. I know, as usual I am probably the last person in blogland to get this on my wall - OH NO the bloomin' frame is too small. Oh well it looks like I'll have to get a new mount for it. I am looking forward to Kirstie Allsop's new programme, Kirstie's Homemade Home which is on Channel 4 and starts next week. I read about it in this article in last Sunday's newspaper. It is all about her renovating a cottage in Devon, restoring furniture, learning new skills, such as block printing, sewing, etc and doing as much of the work herself as possible. Sounds just like the sort of programme that will be popular here in blogland. I hope it is as good as it sounds. 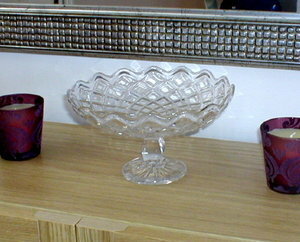 Busy busy busy.....spring cleaning, declutterng and re-organising. That is what I have the urge to do this week. Kitchen cupboards have been emptied, cleaned and tidied. At last I have some space in them! I am now re-organised my cds into new little cd boxes. £1.30 from Morrisons - what a bargain! They all stack on top of each other in my little cupboard, instead of a jumble of cds that fall out every time you try to find one. Oh the little things that make me happy. A 'freezer' week is on the menu here in the lazylol house. We have two freezers, both stuffed to bursting point with BOGOF offers etc which I regularly buy and forget about. I think we could survive for a good couple of months on the stuff in there and still I buy more! So on Monday I decided I would not buy more and would use up as much as possible. I keep pulling out things I have no recollection of purchasing and another favourite of mine, label-less leftovers. Freezer bags full of...well I'm not really sure. Spag bol or perhaps it is chilli? Soup, stew, or some sort of curry or casserole? The list goes on. Oh what joy - I have my computer back from the shop! Last Friday evening, I had a bit of a drama, the computer had a virus and was as dead as a dodo. The man in the computer repair shop traumatised me by declaring that I would lose everything. Luckily I had backed it up a couple of months ago so I will probably only lose the most recent stuff. I can live with that. Having said that I haven't even checked it yet. I've been too busy reinstalling all the blooming programmes I use. One good thing though, I had my memory upgraded (...if only ;) ) so I am very happy that this computer is running much faster and there is much less swearing going on. I received this award from Kitty which makes me happy and I am going to pass it on to all my blog friends who stop by and leave me lovely comments and make my whole blogging experience much happier! Thanks ladies - you make my day! I would also like to pass it on to Diane who has a shiny new blog, Heart Shaped. Please stop by and say hello! I went out partying last night so am feeling a little fragile today. I'm drinking lots of water and tea and am starting to feel a bit better, I may even be able to face food shortly! I was a little bit spooked by the last 3 word verification letters I've had to type when leaving comments were REPPENT, ANGast (Ang my real name) and CULASS. I kid you not - should I be worried? Hello - I am back from my trip to the seaside. 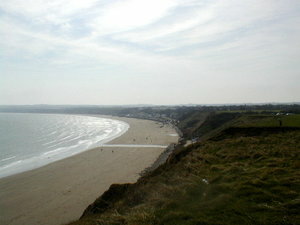 We stayed in lovely Skipsea but took a trip up to Filey on Monday. 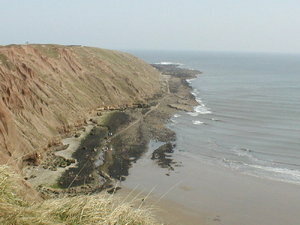 The above pictures are of the stunning views from Filey Brigg. It was a cold crisp but sunny day, just what I needed to blow away the winter cobwebs! We spent all our days away visting the area and one evening in the pub. We played scrabble on the other two evenings - I haven't played for years and I really enjoyed it. Copious amounts of food & wine were consumed. I'm glad to report that I had a lovely time AND the house is just how I left it. The neighbours didn't get disturbed by partying teens and I haven't been eaten out of house and home. What a relief! 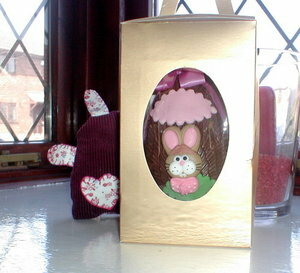 I bought an handmade chocolate egg for myself (how indulgent) from a lovely little old chocolate shop in Filey and also managed a bit of thrifting! 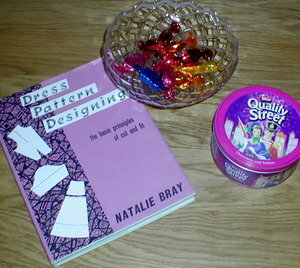 A pattern drafting book for 50p (just what I needed too), a cute little Quality Street tin and a glass bon bon dish.